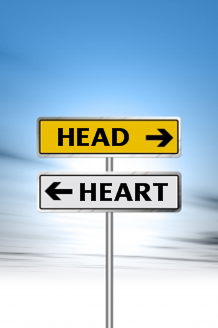 So often, when we come to a fork in the road, our hearts want to take us in one direction, and our heads want to take us in another. It’s been at least a decade since I last allowed my head to rule my heart. That lesson was so profoundly expensive, that I’ve followed my heart pretty faithfully ever since. 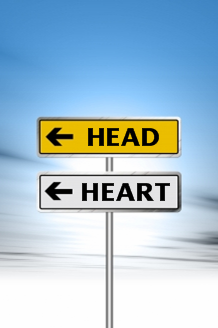 Now that I’ve gotten to that place–which feels incredibly right to me–it makes me sad to witness heart vs. head battles in which someone’s head wins. Our heart’s desire is simple: all it wants is happiness. To see someone reason him- or herself out of happiness seems utterly contradictory to me. In my own life, I’ve watched it happen with two men that I loved. When we were together, their hearts–childlike and innocent–simply said, “I love you. I respect and adm ire you. You bring out the best in me, and I like who I am when we’re together.” But when we were apart, their minds processed logistics, statistics, circumstances, and situations–calculating geographical distances, drive times, livelihoods, pensions, and parenting. Their heart vs. mind battles were epic, and all I could do was hope that they would ultimately choose the road that led to me. But in the end, they did not. 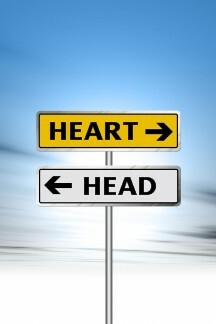 Does following my heart mean that my head isn’t involved in my life’s journey? No, not at all. Following my heart simply means that I trust it to point me in the direction of happiness. Then my head figures out how to get from here to there. if . . .?” questions, or struggle with as many “If only . . .” regrets. When I put both my heart and mind into something, I know I’ve given it my all, and if an endeavor fails, it’s easier to chalk it up to experience and move on.